Following closely in the footsteps of 'Legacy', the recent new album from Legendary NYC Disco band Odyssey comes the incredible all star remix album from ISM records. 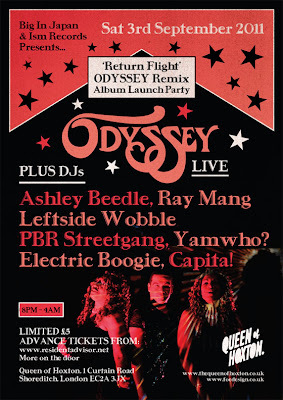 To celebrate the release of the album 'Return Flight' we are super excited to announce this special party at the Queen of Hoxton in Shoreditch. 2 Floors filled with the best disco, funk, electro & boogie with a late licence and the famed QOH rooftop BBQ! !With a penchant for dramatics the BIJ crew will be introducing some added production to the venue to immerse our guests in what is sure to be yet another fine shake down. Get this one in the Diary and please do send on to all good folk!